These images are provided to foster education about Johne’s disease. They are distributed under the terms of the Creative Commons Attribution License which permits unrestricted use, distribution, and reproduction in any medium, provided the source, johnes.org, is credited. If higher resolution versions of these images are required, please contact the site author: M.T. Collins. Commercial users may be asked to pay a fee for commercial use of high quality images. Holstein cow showing weight loss (also called low body condition). At this late stage of MAP infection dairy cattle also usually have diarrhea and decreased milk production. Other diseases can cause similar clinical signs so laboratory testing or a necropsy (autopsy) is required to confirm the diagnosis. Photo taken on a dairy farm in southern Chile by M.T. Collins while on sabbatical at Universidad Austral de Chile. Same cow as above demonstrating watery “hose pipe” diarrhea. This diarrhea results from the intestinal pathology caused by MAP infection: a protein losing enteropathy. Protein loss from the gastrointestinal tract is a major reason for the weight loss and decreased milk production seen in dairy cattle with clinical Johne’s disease. Photo taken on a dairy farm in southern Chile by M.T. Collins while on sabbatical at Universidad Austral de Chile. The watery diarrhea from dairy cow pictured above has bubbles on the surface and is foul smelling due to the increased protein in the manure (feces). While diarrhea is a common clinical sign of Johne’s disease in cattle, it is less often seen in goats and sheep. 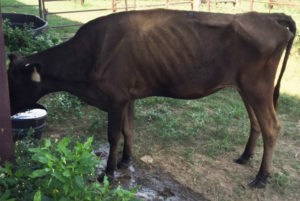 Guernsey cow with weight loss typical of clinical Johne’s disease. Photo by M.T. Collins taken at the University of Wisconsin, School of Veterinary Medicine. Angus cow showing weight loss due to Johne’s disease. Photo taken on a beef cattle ranch in southern Chile by M.T. Collins while on sabbatical at Universidad Austral de Chile. 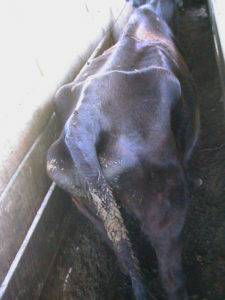 View of the same Angus cow shown above with photo taken above and behind the cow to highlight the poor body condition. Photo taken on a beef cattle ranch in southern Chile by M.T. Collins while on sabbatical at Universidad Austral de Chile. 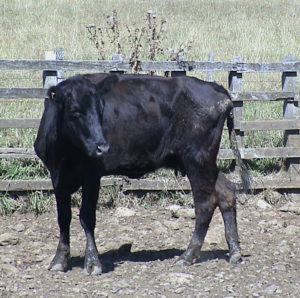 Thin Waygu breed cow with Johne’s disease on a ranch in the U.S. Photo generously donated by the animal owner. Cattle breeders buy, sell and trade animals frequently. They also provide animals of superior genetics to commercial cattle producers, both dairy and beef cattle. For these reasons, it is imperative that the herds are free of MAP-infected animals, verified by laboratory tests annually. 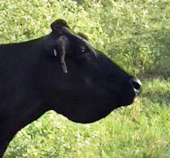 Submandibular edema, commonly called “bottle jaw” see in a Waygu cow. Fluid leaks out of blood vessels because of low oncotic pressure. Low oncotic pressure is due to low serum albumin levels which in turn are the results of the protein being lost through the gastrointestinal (GI) tract. The thickened intestine results from the granulomatous inflammation induced by the MAP infection. Photo generously donated by the animal owner. 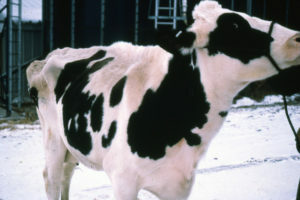 Submandibular edema (“bottle jaw”) in a Holstein cow. Photo by M.T. Collins taken at the University of Wisconsin, School of Veterinary Medicine. 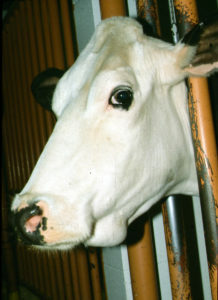 Submandibular edema (“bottle jaw”) in a Jersey cow. Photo by M.T. Collins taken on a dairy farm in Wisconsin. 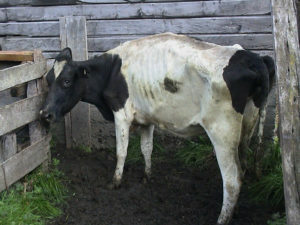 Holstein cow in Wisconsin showing low body condition (thin). 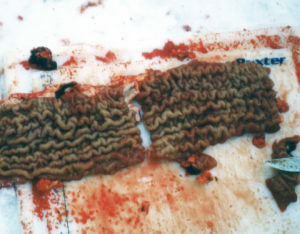 On a snowy winter day, this cow was necropsied on the farm and the obviously thickened intestine from the cow is shown below. A field necropsy like this is an effective was to arrive at a presumptive diagnosis of Johne’s disease. A definitive diagnosis can be made by sending a portion of the affected intestine to a veterinary diagnostic laboratory requesting both histopathology and PCR to detect MAP. Photos by M.T. Collins. 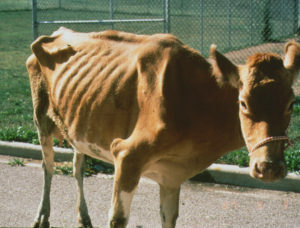 Animals with clinical Johne's disease typically show significant weight loss. Cattle also show diarrhea with dairy cattle having decreased milk production.